Inspired by the classic Universal film that launched a legacy of horror, "The Wolfman" brings the myth of a cursed man back to its iconic origins. Oscar® winner Benicio Del Toro stars as Lawrence Talbot, a haunted nobleman lured back to his family estate after his brother vanishes. Reunited with his estranged father (Oscar® winner Anthony Hopkins), Talbot sets out to find his brother...and discovers a horrifying destiny for himself. 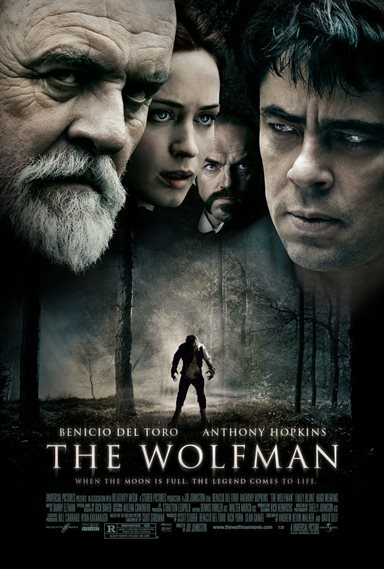 Download The Wolfman in Digital HD from the iTunes store. The Wolfman images are © Relativity Media. All Rights Reserved. Universal, the studio that created such horror classic's as the Mummy, the Wolfman, and Dracula are in remake mode again with 2010's "The Wolfman". "The Wolfman" brings the myth of a cursed man back to its iconic origins. 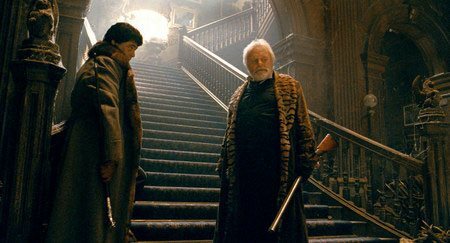 Oscar® winner, Benicio Del Toro, stars as Lawrence Talbot, a haunted nobleman lured back to his family estate after his brother vanishes. Reunited with his estranged father (Oscar® winner Anthony Hopkins), Talbot sets out to find his brother...and discovers a horrifying destiny for himself. 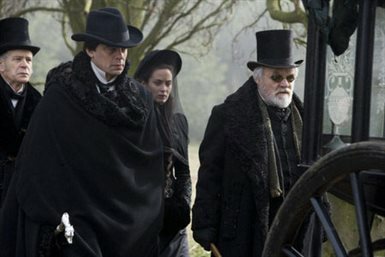 Being a sucker for Victorian piece films, I was instantly intrquiged the first time I saw the trailer for this remake. In fact the sets in the film are simply amazing; the film shows 1890 England in such a fashion that you are feel like you are really there. Sadly, this is one of the only highlights of this two-hour film. The acting is a mixed bag this time are around, and Benicio Del Toro gives one of his best performances yet, while Emily Blunt proves yet again she is a wonderful up-and-coming actress. However, at the same time, Sir Anthony Hopkins and Hugo Weaving appear to just be going through the motions, and not really giving it all to their parts. While the director, Joe Johnston, skillfully crafted a successful third film in the Jurassic Park series; he failed miserably in the Wolfman. In fact, this is probably, for the most part (aside from the script), why the movie failed. His direction seemed extremely lack luster, trying to be artful with angle shots and slow-motion techniques that took you out of thepicture -- instead of engulfing you in it. It appears that instead of Universal asking themselves if they could re-make The Wolman, they should have stopped and asked themselves if they should. The original Wolfman film will still remain a classic, however, this one is just left howling in the wind. The Wolfman images © Relativity Media. All Rights Reserved.